It’s no secret that we belong to a culture fascinated by the concept of one man’s trash being another’s treasure. Scouring carefully through flea market setups, spending hours rifling through shelves of knickknacks in antique stores and picking apart the selection at every local thrift store are pastimes the tried and true regard as treasure hunting, or the hope of finding the one diamond-in-the-rough item that exists nowhere else. Whether it be a devotion to preserving history, satisfying a hobby or giving pop culture phenomena like Hoarders a reason to exist, buying, selling and collecting this diverse, niche-based cultural memorabilia is a trend both the general public and media realm are jumping in on. While many low-key collectors and purveyors of such items get their kicks from vintage tea sets, handmade cuckoo clocks, retro jukeboxes and the like, there is a rather obscure, and some could say not-for-the-faint-of-heart, side to the art. When the Science Channel introduced its reality television documentary series Oddities to the world in 2010, it opened the public door to a whole new realm of mystifying—and, in large part, macabre—collections of bizarre finds, all housed within a strange sensation called the Oddity Shop. These quirky rarity shops, scattered across the country in brick and mortar establishments and online hubs, house thousands of carefully procured artifacts ranging from wacky to morbid and hitting most every adjective between (how does one classify a Rhesus monkey skull?). It is not uncommon for a visitor to stumble upon finds like straight jackets taken from old mental asylums, art made from nail clippings, jewelry detailed with human hair, freeze-dried bats and, yes, even, on occasion, your run-of-the-mill mummified cat (perfect for when you’re stumped on gift ideas). Owners of and buyers for these odd shops collect from national and international markets, procuring items found in places like flea markets, antique shops and even, on occasion, the homes of people across the country with a hankering for the strange and eerie. Although much of the oddity dealing business takes place online via avenues like the Oddity Shop and even Etsy, there is still a fair share of street-side locations across America. We’ve built a short guide to some of the country’s most wonder-filled oddity shops and where you can find them (entering at your own risk). Located in Manhattan’s East Village in an old funeral home, this higher-end home for the bizarre is the location that inspired the hit television show about the industry. In this shop, you can find anything from unique and quirky furniture to macabre vintage collectibles like Victorian medical diagrams and taxidermy. One thing about this place is for sure—it’s always full of surprises, and though you’re not guaranteed to leave with anything, you’ll certainly walk away remembering everything. Featured on the spinoff series Oddities San Francisco, this West Coast store houses the quirky and creepy, marketing antiques of all shapes and sizes, including, but certainly not limited to, a rare Freeman lobotomy set and vintage gold plated birthing forceps. They also house a natural history section, containing all sorts of specimen—framed, preserved in Lucite or otherwise—including small octopuses, rhino beetles, bats and snake skeletons. Also, if you’re scouting for a taxidermied blowfish, consider this your one-stop shop. Complete with an accompanying museum of funky artifacts that’s been around for more than 100 years, this Seattle-based space offers ’round the world wonders such as shrunken heads, mummies, and badger skulls. Visitors from the 1800s used to travel far and wide to see the “1001 curious things” entrepreneur Joseph Edward Standley accumulated for those with an eye for curious things to behold, and the tradition still remains intact. Don’t forget to check out the shop’s two mummified human bodies, Sylvester and Sylvia—don’t worry, they’re not for sale. 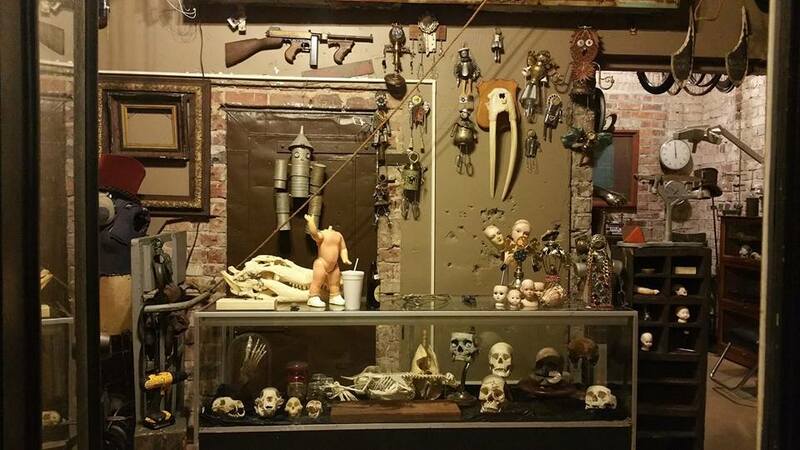 A more recent addition to the oddity world, this gallery of obscure objects located in Alabama has everything from tribal human trophy skulls to handmade voodoo dolls. Old gas masks, an assortment of animal teeth, professionally cleaned turtle shells and vintage wheelchairs are other items procured and distributed by the collectors. They’ve even offered insect mounting classes for those really looking to get a piece of the action. Sure, anyone can have a deer head mounted on their wall, but where can you find a giraffe head and neck ready to decorate your space? This is one of the many things you may be able to spot coming in and out of the Chicago-based store, which specializes in everything from vintage and antique taxidermy, to funerary and military items. You can take a virtual tour of their store online, so you don’t have to miss out on all the fun if you don’t live near enough.